It is almost about time for the world’s first FIFA World Cup to available in 3D and FIFA and Sony just announced a bit more information about it, including which of games will actually be shot in 3D. With a total of seven pairs of Sony’s professional HDC cameras on rigs at every match (Sony HDC-1500), the action on the pitch will be captured in a stunning 3D quality enabled through its proprietary multi-image processor (Sony MPE-200) and 3D Outside Broadcast truck. Sony’s cutting-edge processor is supposedly the only one in the market to date that makes an end-to-end workflow possible in the production process and automatically adjusts the depth-of-field to ensure optimal 3D viewing experience. 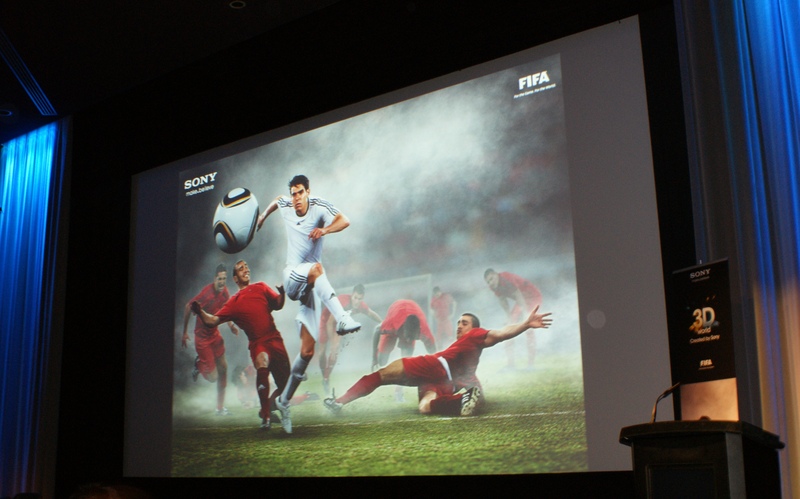 Starting from the FIFA Confederations Cup last year in South Africa, Sony has been working on enhancing the 3D capturing of fast-moving football action and has since conducted a number of 3D filming trials in Europe to provide the best experience to the football (soccer) fans. 3D filming will be realised at five out of the 10 FIFA World Cup stadiums: Soccer City and Ellis Park in Johannesburg, Durban, Cape Town and Port Elizabeth. 25 matches in total will be filmed and broadcast in 3D, which will include a carefully chosen selection of those games expected to attract most public attention, including the opening game on June 11 at Soccer City (South Africa vs Mexico) and the crowning final game on July 11 also in Johannesburg. The 3D feed from these 25 matches will be made available for broadcast on 3D TV channels, which can be enjoyed by consumers on their 3D-compatible TV sets at home. The first confirmed partners for the 3D TV live broadcast are ESPN in the US and Sogecable in Spain with more to come apparently. Eight matches will be fed live to digital cinemas and selected venues in 3D HD quality around the globe, and FIFA has appointed Swiss-based Aruna Media AG to manage the exclusive 3D cinema and entertainment venue rights for live games in 3D. Aruna plans to broadcast live 3D coverage of matches to around 26 countries and is in advanced discussions with several major markets. Complementing the 3D live broadcast and public viewing activities, the general public will also be able to exclusively enjoy the 3D promotional trailers shown on Sony 3D BRAVIA TVs in around 4,000 Sony-affiliated retail stores worldwide (1,500 in North America, 1,300 in Europe, 500 in Japan, 200 in Asia, 200 in Latin America, and 30 in South Africa). Furthermore, Sony Pictures Home Entertainment also plans to produce and distribute the official FIFA film in 3D on Blu-ray Disc later this year. Is it possible to see it on internet? They have not announced such plans yet, so most likely it will not be broadcasted online like they did with the Masters golf tournament. I hope ESPN or Sony add a couple more games in 3D-HD. I like to watch USA vs England in 3D as well. PS: Your spam bot blogged me several times when I tried to post messages at other threads! Will 3d broadcasting support HD or SD? Hi, will any of the games listed to be in 3D be available on SBS (Australia)?